Hosting a meetup? Tell us about it and we’ll spread the word and include it on the Meetups page. Email HQ the details of your event. 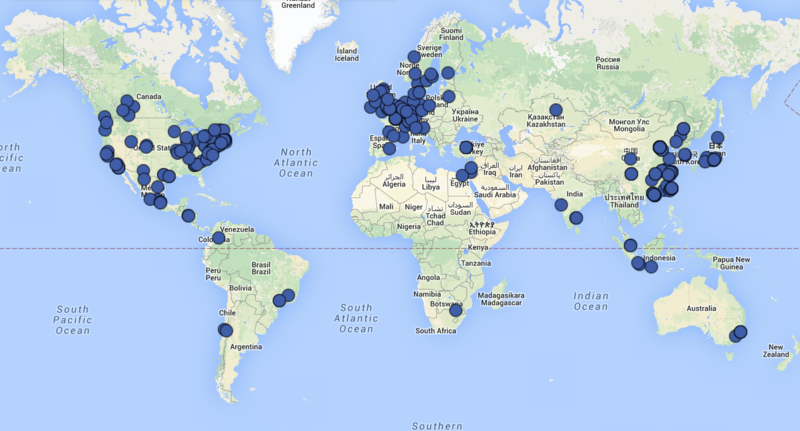 iGEM is proud to announce that 280 iGEM teams have registered to take part in the iGEM 2015 competition. See the complete list here. Now is the perfect time to host a meetup and connect with other iGEMers in your area. Through meetups you can brainstorm ideas, receive feedback, learn tips from veterans, and much more. Visit our Meetup page to find an event near you. We are continuously updating this page so please check back often. Know of an event not listed on our page? Email HQ details of your meeting and we’ll help you spread the word. DNA distribution kits have all been sent out. Each kit contains over 1000 sequence confirmed parts from the Registry of Standard Biological Parts! It is a collection of popular parts included in previous distributions as well as selected part submissions from iGEM 2014 teams. Please check out our 2015 DNA Distribution Kit Handbook and Distribution Contents page for more information. Call for proposals: Get funding for your Human Practices work! This opportunity is open to all iGEM teams. Deadline: proposals due date is May 15. See below for details. Webinar on May 27: "SimBiology and MATLAB for Modeling Synthetic Biology Systems". Special Offer: Complimentary software for use in the 2015 iGEM competition. See below for details. Special Offer: Register now and take advantage of IDT's free DNA offer. Save the date: Webinar on June 24. For updates and registration, or to view April’s webinar, see below. Announcing 8 iGEMers awarded Synbio LEAP 2015 Fellowship including HQ Fellow Kim de Mora! The Synthetic Biology Leaders Excellence Accelerator Program Synbio LEAP is a unique program for leaders in the synthetic biology field. We are excited to announce that Kim de Mora, iGEM HQ Fellow, has been awarded the LEAP fellowship. Among his many accomplishments is a Ph.D in Synthetic Biology from the University of Edinburgh and involvement in iGEM since competing in 2006. At iGEM, Kim manages the judging for the iGEM competition as well as the new tracks programs. Please join us in congratulating Kim along with all our iGEMer LEAP awardees on this great accomplishment! All iGEM teams are invited and encouraged to participate in the Second International InterLab Measurement Study in Synthetic Biology. We had 45 teams participate in 2014 - will you help us do even better this year? For more information and to sign up, check out the InterLab 2015 page. Get funding for your Human Practices work. Proposals due May 15. With an iGEM-Synenergene partnership you can work with science museums, think tanks, and other institutions in Europe and around the world to promote responsible research and innovation. This opportunity is open to all iGEM teams. For application information and additional details, see the Synenergene sponsor page. If you haven’t registered with IDT, please do so soon. After you register, you will receive account information and instructions on how to take advantage of the free DNA! Mark your calendar! We will have another webinar for all iGEM teams on June 24th. If you couldn’t attend the April webinar, watch the video here. For more details visit the IDT sponsors page. Special Offer: Complimentary software for use in the 2015 iGEM competition. This webinar will provide iGEM teams with an introduction to modeling, simulation and analysis with MATLAB and SimBiology using an example from synthetic biology literature. Register here. For more details visit Mathworks sponsor page.